Energy efficiency, lots of light, unobstructed views, and color are driving today’s window trends, according to industry experts. 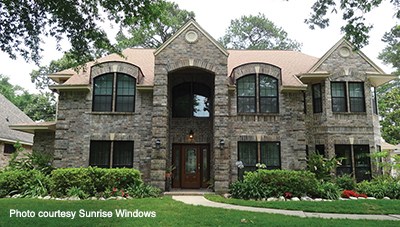 Efficiency is almost always the number one reason that homeowners look to replace their windows, according to Joe Mills of Sunrise Windows and Doors. Offering a primer about window terminology, he says, “The industry has created some testing and ratings that help that process. The U factor measures how well the product keeps the heat in during the heating months. SHGC (Solar Heat Gain Coefficient) is a measure of how well the glass keeps the sun’s heat out during the summer months. 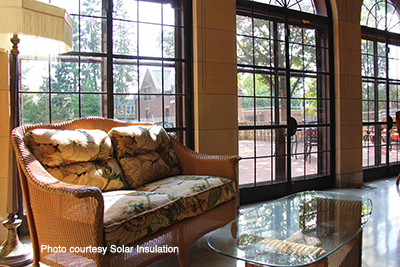 “Energy savings is one of the top reasons our customers use window film,” says Margaret Shrewsbury of Solar Insulation. The company favors its newest product addition, 3M Thinsulate Window Film. Installed on the interior side of existing windows, it has a very high light transmission and a neutral appearance, maintaining the home’s existing appearance. Benefits include increased insulation performance, improved interior comfort in summer and winter, longer life for furnishings due to a reduction of UV rays, and a comprehensive warranty from 3M. Shrewsbury says adding 3M Thinsulate Window Film may provide performance similar to adding another pane of glass. New windows may be unnecessary. Most of Solar Insulation’s window films provide over 99% protection from UVA and UVB which are the biggest contributors to fade damage. “CR or Condensation Resistance measures how a product handles condensation. I’ve always believed that this number can be deceiving as the more airtight a window is (a good thing) the more potential there is for condensation. VT stands for Visible Transmittance, a measurement of how much light the window lets in. Again a focus on this number can lead to choosing a poor performing window from an efficiency standpoint.” Sunrise Windows partners with Durante Home Exteriors in the Nashville area. Windows that accommodate more expansive views and ventilation are gaining popularity, the experts say. Awnings and sliders meet these requirements with their horizontal configurations and ability to open wide when a tempting breeze blows by. “We’re seeing more color, and we’re seeing a lot of darker colors,” says Ply Gem’s Montgomery says. “Two of our largest selling colors are black and bronze.” Several years ago, the company introduced a coextrusion technology for its higher-line vinyl products that allows customers to choose a darker exterior color, such as bronze while maintaining a traditional white interior finish. Natural light is what it’s all about this year, and homeowners are embracing the sun by installing large casement windows, especially in living and dining areas. Wide, pane-free casement windows allow for uninterrupted views and can be matched to almost any architectural style, including modern homes. Their simplicity and beauty make them ideal for many households, but recently homeowners have been drawn to very large versions, often floor-to-ceiling windows. Big glass is definitely trending, according to Kazukewicz, “and while it’s a favorite for contemporary styles, we’re also seeing larger windows in every style of home from traditional to modern. 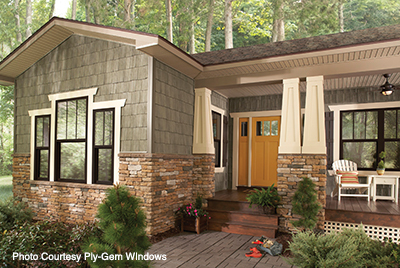 The Marvin Ultimate Casement window is especially popular in contemporary design, and with standard sizes, up to 5 feet wide and 10 feet tall, the Marvin Next Generation Ultimate Double Hung window is a favorite in more traditional designs.